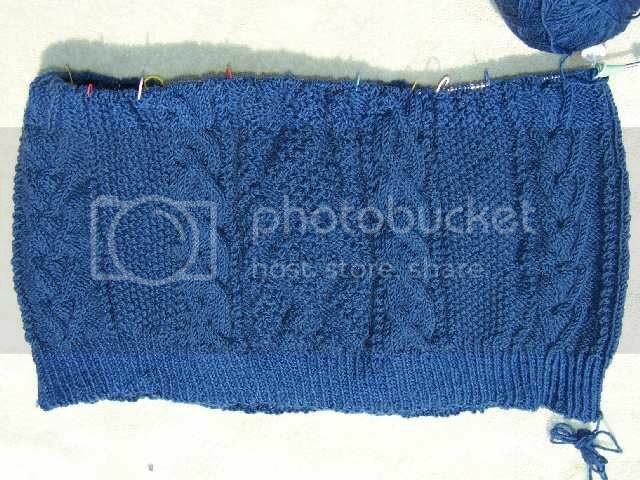 Wendy 5 ply Guernsey wool in shade 674, the lighter of the traditional blues, was used for this sweater started quite some time ago. 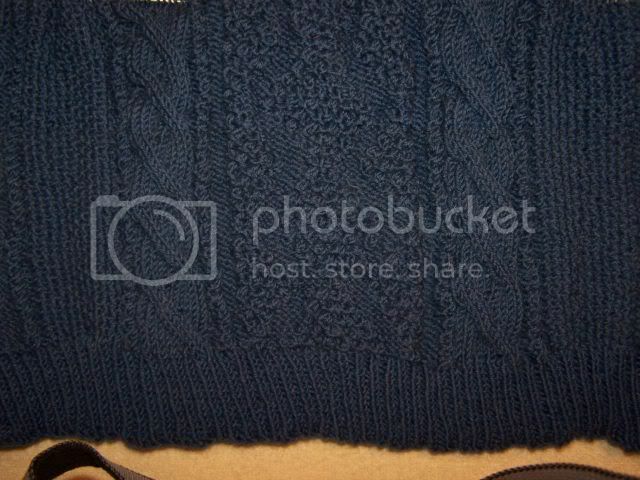 The pattern is an old Plymouth Yarn Company aran pullover #IN34. I was trying to use the Wendy in place of an alpaca and and just adjust the size knit to fit me instead of a man. Well...... even though I swatched and the swatch was perfect, the sweater was less than. Ended up at 9 stitches to an inch on size #3 US circular. Sweater measures 36" around - not in this lifetime!! So as pretty as the pattern is, it will get ripped, re-swatched and hopefully used for the KAL "Beadwork" to start this fall. I HAVE to learn to remeasure as I go along more often. At least the cable patterns really pop with a tight gague and this yarn. Anne, that is simply lovely. I love the colour and the pattern is excellent - it is amazing how it does pop even though the colour is dark! Sorry that the sizing is not good; although a sweater that doesn't fit is hardly practical! Being a lazy measurer myself this is a good lesson for me (and hopefully one I will follow!). Sorry about this pattern sizing not working out. But the yarn will be gorgeous for Beadwork! I love the color. Oh no! So sorry to hear that the sweater was too small. Sounds like you have a good mindset about it though....frog it and move on to better things! Well, Linda, there is something therapeutic about frogging a project that just isn't working out right. I just did that to a shawl that was well over 2/3 done, and I'm not at all sorry! You'll be happy when you start knitting Beadwork, and I'm willing to bet the gauge checks will be frequent! Oops... sorry, Anne, I called you by the wrong name! Twenty lashes with a piece of FunFur for me... and Anne is my middle name, too!